First up – the weather. If this was a full-size Project Horus launch, we would have likely cancelled and re-scheduled the flight. However, since this was just a small test flight with a disposable payload, we decided to have a go. 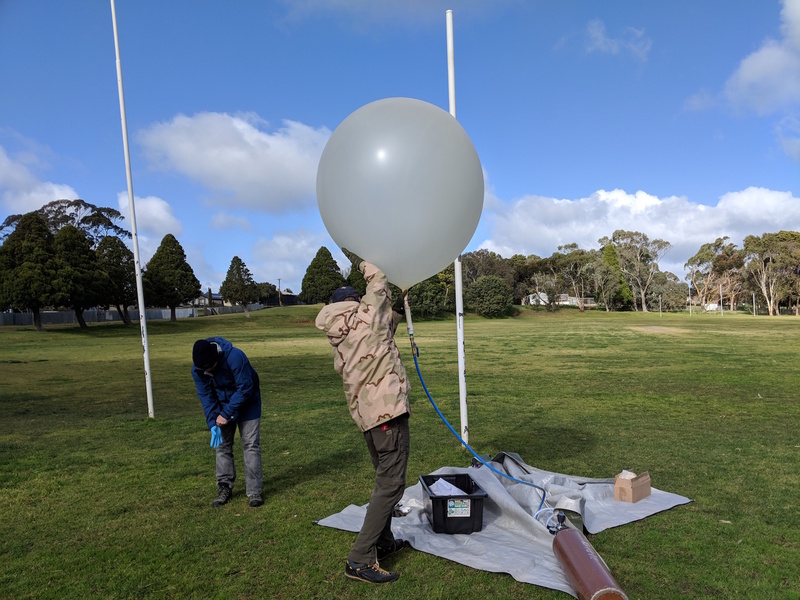 Thankfully we didn’t experience the forecast showers, however 30-40kph winds at the launch site made filling an exciting experience, with the balloon blown all over the place. Mark VK5QI, Will VK5AHV, Chris VK5FR and Matt VK5HZ were the launch crew for the morning. Graham VK5GH also made an appearance. Just as we were starting to tie off the balloon a wind gust came up and tore the balloon off the fillter… goodbye balloon! (Memories of Horus 8, though this time without the garage to stop the balloon flying away). There was just enough gas left in the cylinder to fill a small ‘backup’ balloon (a 100g Hwoyee) and get enough lift to get the payload in the air. The achieved ascent rate after launch was ~3m/s, a bit lower than the planned 5m/s, however with the switch to a smaller balloon, this actually resulted in a fairly similar flight path to what was originally planned. The first part of the flight went pretty normally. Many receiving stations came online to decode the new 4FSK Horus Binary mode, including a few new callsigns. Will VK5AHV and Mark VK5QI headed off towards Bear Rock to track the payload as long as possible, while Marcus VK5WTF was already stationed up on Accomodation Hill to do the same. Ivan VK5HS and Peter VK5PE were already out in the expected landing area (South of Loxton), recovering the morning’s Bureau of Meteorology radiosonde launch. At just about 9km altitude… something went wrong in the payload. 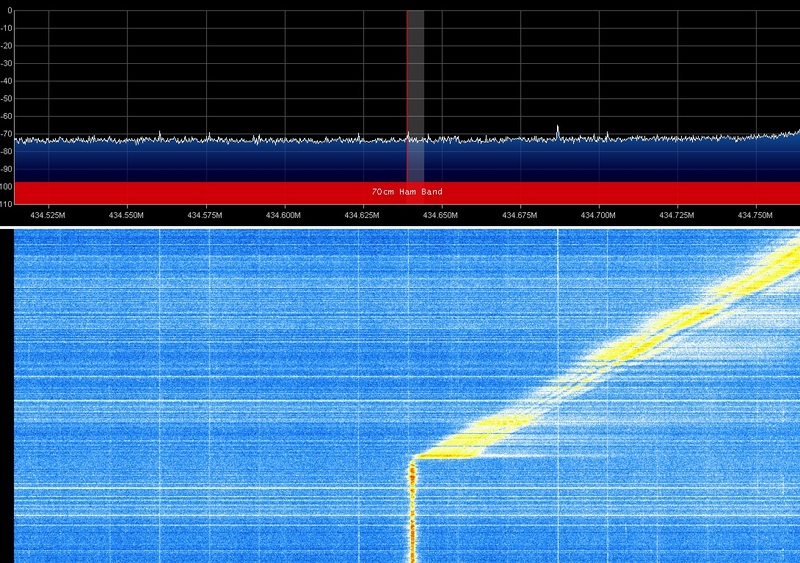 The signal became very wide, and then immediately started drifting up the band. The current theory is that the payload flew through a cloud on ascent, and a combination of condensation within the payload and extreme cold caused some problem with the radio IC. UPDATE: Testing has confirmed that the issue was related to insufficient insulation around the radio IC. Better sealing around the payload edges solves the issue, and hopefully this won’t occur on future flights. The transmitted signal continued to drift up through the 70cm band, topping out at about 436.4 MHz before descending back down again. 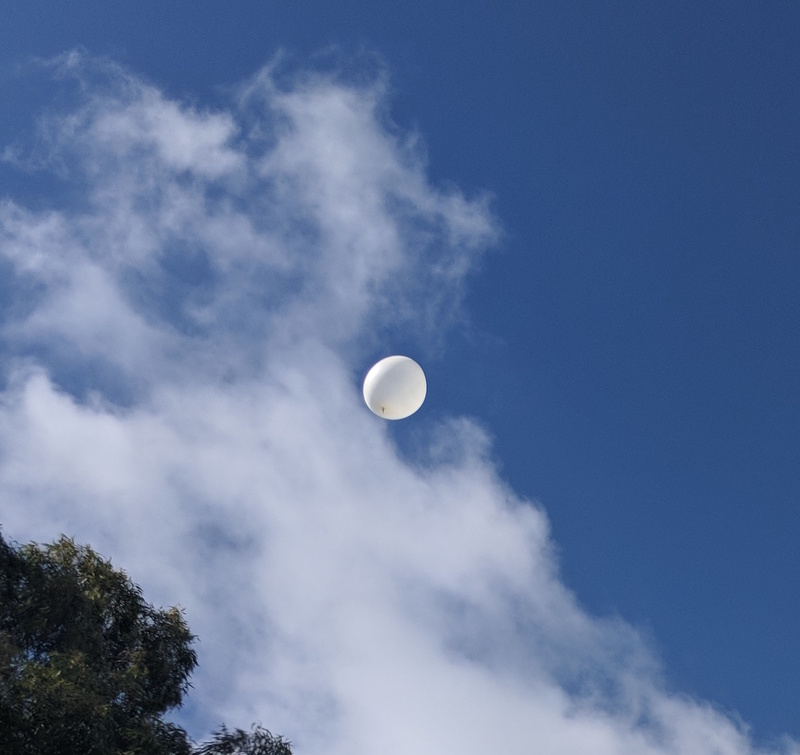 At some point (estimated to be about 21km altitude) the balloon burst, sending the payload quickly back towards the ground. Quickly we rushed to get the decoder up and running again, to find the payload was at ~1km altitude and dropping fast. From Bear Rock we were able to decode the payload down to ~300m (at a distance of 140km, not bad!). Peter VK5PE’s home station in Renmark was able to track it down a bit further, to ~220m. Ivan and Pete turned around (they were halfway back to Renmark) and were able to recover the payload not far from the last reported position. Peter VK5PE with the payload in hand! Thanks to all for your participation! We will be evaluating the received data and working out better ways of weatherproofing the modified RS41 payloads to avoid the issues encountered on this flight. Expect to see the Horus Binary telemetry on future flights! This entry was posted in Club Activities, Project Horus by VK5QI. Bookmark the permalink.